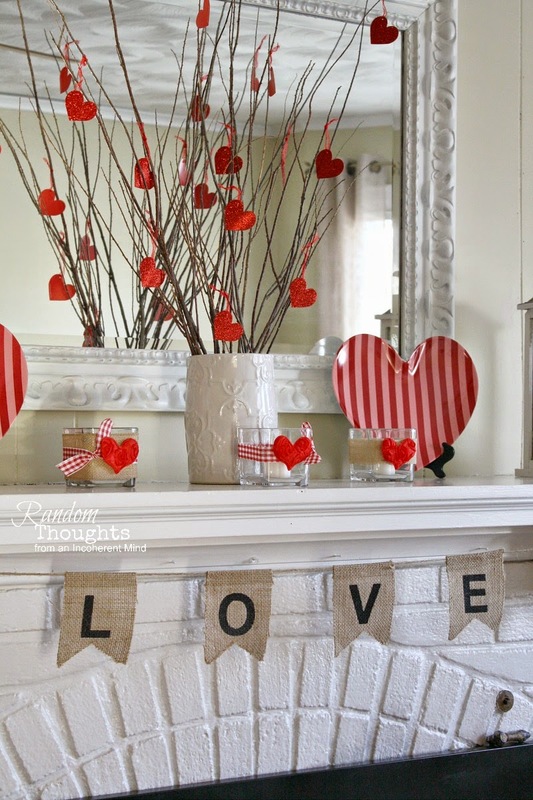 I had to force myself to decorate for Valentine's Day this year. but I just wasn't feeling it this year. I only spent about $10.00 total here. (on the branches) from Hobby Lobby for $6.00. Everything else was stuff I already had on hand. & changed all the other items. I stacked up a basket & a crate for the hearth. & the pillow I made a couple of years ago. Simple heart gift tags hang from a few branches. once Valentine's Day is over. or do you skip it? Your mantel is so pretty, as always. I do love those heart shaped plates! I do decorate my table, but that is about it these days - children are grown and grandchildren almost are!! You do simple "pretty perfect", my friend! Wishing you safe and warm as you endure the winter. 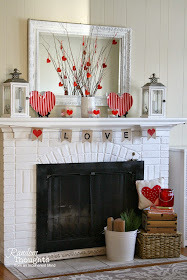 Have to say that I skip decorating the mantel for Valentines Day...but I love how yours looks. I still have my wintery look going on and it is snowing again here today, so looks like winter will be staying on the mantel for a wee bit longer as well! Have a great day Gina!! I decorate a little. Got to get to it soon! I love the heart shaped plates Gina! I think simple is better! Adorable Gina! Not sure if I will be pulling out My Valentine decorations this year! I always make cookies or dessert. Love it, Gina! It's simply perfect!! Oh my goodness! I love, love, love! I'm one to like everything equally balanced like yours. Sometimes like today, I mix it up a bit. I'm more happy with yours. Hi Gina! Oh, honey, you always put together the most gorgeous mantels and this one is just that - gorgeous! Love your lanterns and heart shaped plates. You're just so good at this! Gina your mantles are always perfect. I love the votives you made and those heart shaped plates are too cute. It is beautiful, Gina! I am not decorating at all for Valentines this year. 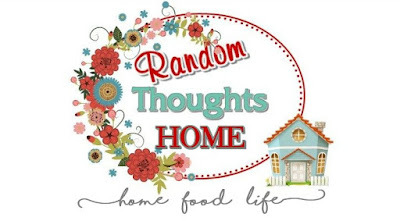 I have so much going on right now that I think I will just wait until Spring time to change things around the house. You did a beautiful job! Well for not being in the mood it sure turned out darling! Love the red and white color theme! Your pillow is super sweet also Gina. 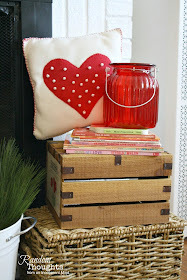 You know me, I love Valentines and really have more décor than I need. Wish I could part with some of it. Maybe someday. lol! Well for NOT being in the mood you pulled it off beautifully as always Gina! Looks adorable. 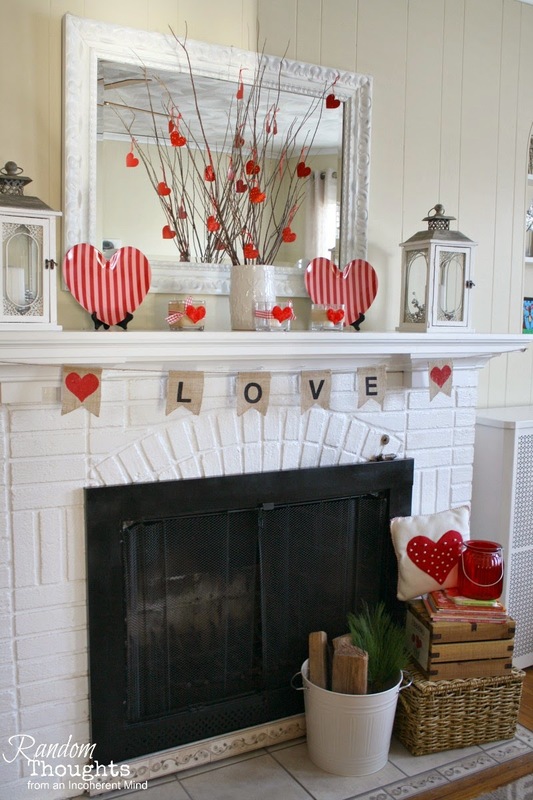 Well, it looks elaborate to me, since I did only itty bitty Valentine decor. I think your mantel looks very pretty. I really like those cute heart-shaped plates and the banner. If I had kiddos around, I would probably do more. It all loks so festive! This is just perfect, Gina. 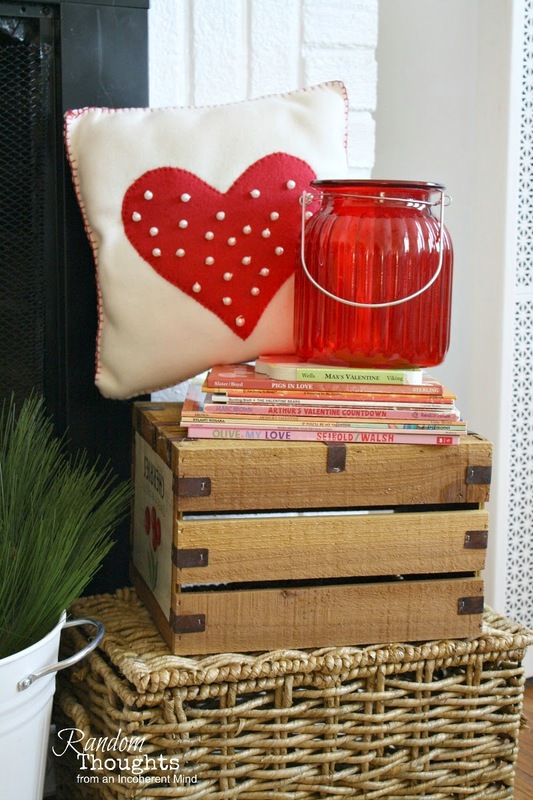 Nice pops of red and hearts here and there. I like it a lot. The red plates from Target are so neat, and I love your handmade pillow. I may add a garland, I have a book of sheet music and it is always inspiring the romantic in me!! 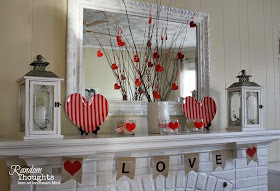 If this is what you come up with when you are "not feeling it" I can only imagine when you go all out :-) It's just lovely Ms. Gina, but then again there hasn't been one of your mantel creations I haven't absolutly loved. I knew you wouldn't disappoint :-) ❤️ Happy Valentine's Day. This is the very first year as far back as my memory takes me that I didn't get out my big box of Val Day stuff. I have a few bits - but ran out of time and energy this year. I entertained a lot in Jan and Feb so far, and it took all of me - so yes I DO decorate, have a little, and ran out of time posting about it. I totally adore yours, Gina. Hugs.